This year I’m going to write a blog post for each day of my TGO Challenge crossing and base the post on one photograph from that day. The photo won’t necessarily be the most stunning scenery but will be something that triggers memories for me. Peterhead was not the prettiest TGO Challenge finish I’ve ever had but it reminded me of Birkenhead in some ways and I felt quite at home. 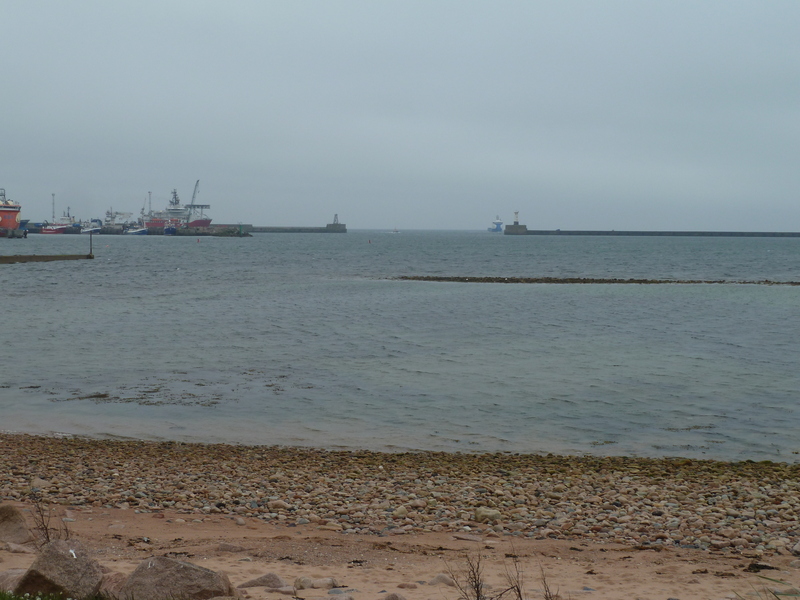 After a walk round the commercial port part of the town – where there was nowhere I could dip my feet in the North Sea – it was good to find the harbour and have a paddle. The weather was cold and windy and I’d been wrapped up warm for the 4 hours it took to walk the last 16km to the coast. I’d had some pleasant company from a local, Bill, for the first 20 minutes and his tips on what I’d see along the way had helped me mentally measure out my progress. I was delighted to find Brew Toon Microbrewery & Café Bar right next door to the bus station. The weakest beer was, if I recall correctly, 4.8% but I managed 2 pints and two plates of food. I needed the calories! This entry was posted in TGO Challenge and tagged Peterhead, TGOC2018. Bookmark the permalink. I really enjoyed that photo review, thank you Judith! Right, we’ve had the exordium now when do we get the real thing. Just joking, I’ve caught up now. Exordium? Have you swallowed a dictionary, Al?